Out of all the places to visit in Los Angeles, a cemetery is probably not your first pick. No one wants to think of death but it is easily the first place you should start a tour of Hollywood. The Hollywood Forever Cemetery is not just a place for funerals. The cemetery has concerts, festivals, movie nights, and even its own tour guide who will teach you all about the cemetery’s rich and scandalous history. Dressed in vintage from head to toe, two different eye colors, and a large folder containing many pictures and Film Noir posters – Art Deco Diva, Karie Bible is passionate about history and Hollywood. When you put that combination together in a cemetery, you have a recipe for eccentric magic. Bible says “It perhaps one of the most creative and innovate cemeteries in the world. 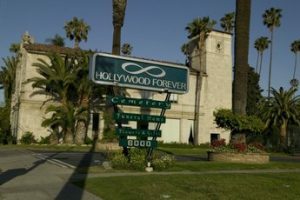 I’ve been to cemeteries in many other countries, but none of them can compare to Hollywood Forever.” She started the tours because of her love of the cemetery’s Hollywood history in 2002. 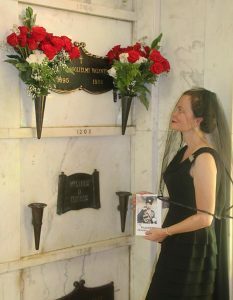 Her tour is not only about its famous residents, but as much about the cemetery history, and the lives of some of Los Angeles’s notorious residents NOT buried on the grounds. It is an easy-to-follow tour with the only difficulty being retaining all the information and trying to not step on someone’s grave. Bible mentions so many films and stars from the cemetery and says, “I would like for people to leave the tour and seek out these films! With TCM, DVD and numerous online viewing portals, it has never been easier to learn about classic Hollywood!” Her tour is really a tribute. While there, I learned about Actor Rudolph Valentino and his infamous “Lady in Black” visitors. If you are unfamiliar with the actor, Bible suggests starting with the movie “The Four Horsemen Of The Apocalypse,” her favorite of the late actors as well as his big break. Valentino passed away at 31 years old and is at the Hollywood Forever Cemetery. Every year on the anniversary of his death he has been visited by a “Lady in Black” bringing a bouquet of red roses. There have been three “Ladies in Black” and several imposters. 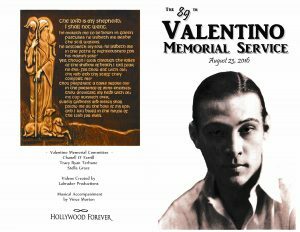 Tuesday, August 23rd is the anniversary of actor Rudolph Valentino’s death and his 89th memorial service. The Memorial starts at 12:10 pm and will include clips of the late actors work, music, poetry, and as Bible says “It is really not about his death as much as it is a celebration of his life, career, and legacy. 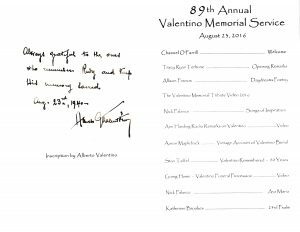 You can expect to see a large number of Valentino fans who are there to pay tribute.” This year, I may just pay tribute myself as a “Lady in Black” imposter complete with a Jade Umbrella. Ciao! Although I’m only 25, I’m a huge Rudy supporter and loved this article! Unfortunately, I live in Ohio and was unable to attend the festivities. I was hoping you knew where I could obtain a program from it? The event was at full capacity and there was a shortage of programs. I will scan the program and post it. I am glad you liked the article and I will be posting some pictures from the day as well. The event was filmed so I believe that it will be posted on the Hollywood Forever Cemetery website. The link is posted above. I updated the blog with the program pictures for you Claire. Enjoy, La Vida Verde.